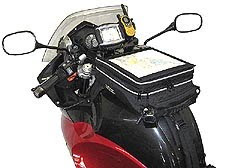 Have a clunker of a tank or tail bag or set of saddlebags? Take advantage of RKA's stimulus program designed to get you into one of their rugged, functional, made in the USA pieces of motorcycle luggage. Under RKA's "Cash for Clunkers" program, you'll get a rebate of $35 or $45 (USD) for each new piece of RKA luggage when you trade-in any brand or model of similar luggage. Plus shipping is a flat $10 on any size order within the CONUS. Check out the details by clicking here. I've owned a couple of RKA tank bags and have found them to be extremely well-made and well thought-out units.